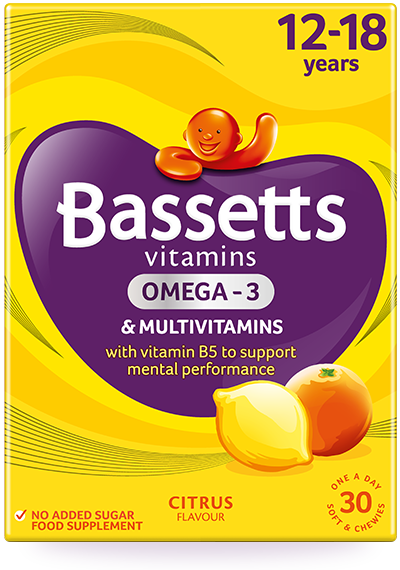 This tasty soft and chewy multivitamin is tailored with a blend of nutrients and Omega-3. To support daily health, it contains nutrients to aid the health of teenagers, including Vitamins B2, B6 and B12 which help to release energy from food and Vitamin B5 for mental performance. Vitamin A helps support healthy skin, Vitamin C helps collagen formation for healthy skin & Vitamin E is an antioxidant as it contributes to the protection of cells from oxidative stress. Sweeteners (Maltitol syrup, Sorbitol, Sucralose), Flaxseed oil (source of Omega-3), Gelatine (Bovine), Vitamin C, Vitamin E, Emulsifier (SOYA lecithin), Orange flavouring, Acid (Malic acid), Pantothenic acid (Vitamin B5), Glazing agent [Vegetable oil (Coconut oil, Palm kernel oil, Sunflower oil), Carnauba wax], Lemon flavouring, Riboflavin (Vitamin B2), Vitamin B6, Vitamin A, Colour (Mixed carotenes), Vitamin D, Vitamin B12. Contains naturally occurring sugars.